As we promised, this research paper has been long overdue since our Director, Lord Pakal Ahau, published his brief notes in Geoff Stray’s Dire Gnosis website and the 2012 Theories forum. 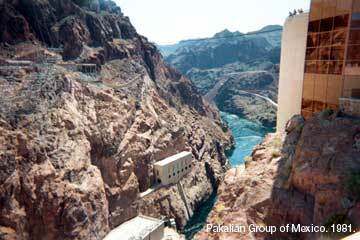 It was April 7, 2001 when Lord Pakal Ahau visited Hoover Dam the first time for plain curiosity. What he found was an extraordinary and unique design by Norwegian-born, naturalized American, Oskar J. W. Hansen. 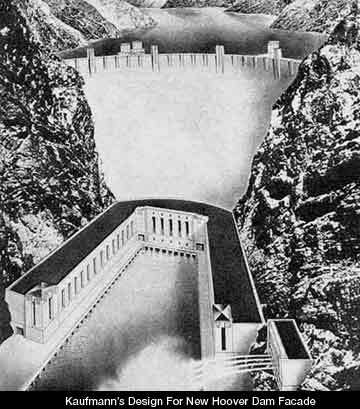 The whole design was built as a request of the American government for Hoover Dam’s inauguration. One of the designs, namely Star Map or Star Chart, according to Hansen, was influenced by important events. Hoover Dam was oficially dedicated under President Franklin D. Roosevelt’s administration on September 30, 1935. What follows is the new compilation paper written by Lord Pakal Ahau. The color photos were taken by Lord Pakal. The black and white photos are hosted in other websites. For more information, not included in this short paper, we refer the reader to the Bureau of Reclamation: Lower Colorado Region – Hoover Dam Home website. Hoover Dam, previously known as Boulder Dam, is a unique engineering wonder as well as an artistic treasure of the U.S. goverment. It was oficially inaugurated on September 30, 1935 by President Franklin Delano Roosevelt. On April 30, 1947, a resolution was signed by President Harry S. Truman restoring the structure’s name from Boulder Canyon Dam to Hoover Dam. Hoover Dam is named for Mr. Herbert Hoover, the Nation’s 31st President. It is the only place in America, to my knowledge, where a celestial map has been included and the bodies of the solar system are placed with accurate precision so we can calculate the precession of the Pole Star. If no other astronomical means are available for future generations, a reference point has been included on how the sky looked at the time Hoover Dam was dedicated. This paper is divided in two parts. 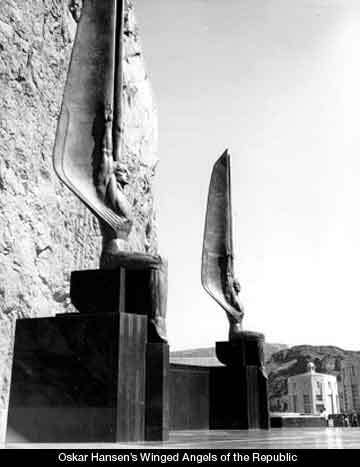 The first part describes the history of Hoover Dam and general artwork, and sculptor Oskar J.W. Hansen’s biography. The second part is more specific and deals with my diagram, photos and explanations of the Star Map, a unique precessional chart. Hoover Dam celebrated his 50th anniversary in 1985 and in 2012 this landmark will commemorate its 77th anniversary, when Earth precession completes approximately five ages of the Maya calendar (December 21, 2012, 11:11 UT). I will atempt to focus my historical narrative of the Hoover Dam from an architectural and artistic point of view because I am more inclined to the teachings and influence of my father, who was a British Bauhaus-schooled architect. Interestingly, my father tried to instill his education and succeeded to a certain point knowing that later in life I would look for the keys and connections of my Maya destiny. In his circle of friends the Modernist style was a prevalent conversation and many samples of his work reflect this functional influence. In this context, Modernism was associated with environmental progress and use of new techniques and materials influenced by ancient cultures such as Mayan, Egyptian and Native American. I was even a young witness of the opening of Brasilia in 1956, the capital of Brazil, during my father’s travels around the world. That was enough reason for me to get a professional degree in environmental science, where I could apply the teachings of my father and his friends around the world. To describe Hoover Dam as a modern icon is not easy task because the style is so simplistic that today architects do not understand the great engineering achievement made during the Great Depression of the 1930’s based on modest costs, ingenuity and dedication. The construction of the Hoover Dam was based in practical issues. The premise was to control the benefits of the Colorado River’s annual flood and use of water storage in Lake Mead. The interest on hydroelectric power was an added value for the regions between Los Angeles and Las Vegas. The massive structure attracted the attention of Americans and world media through the power of technology, a hope for clean energy and the ability of man to control Nature. In the original design, there was a clash of harmony and contradictions between engineering and architecture. While in New York, architecture was tasteful with conservative development. In Chicago, it was a refinement of a solid tradition. In California and West Coast, it was open experimentation. Among the architects given the design to rework the dam, Architect Gordon B. Kaufmann was selected by the Bureau of Reclamation engineers by January 1933. Gordon B. Kaufmann (1888-1949) was an English-born American architect. He arrived in California in 1914 and during his early career he did much work in the Mediterranean Revival Style which had become popular at that time. Kaufmann worked primarily in the Art Deco style, with a personal emphasis on massively thick, streamlined concrete walls. Kaufmann also redesigned the spillways to be more streamlined, added lights to the top of the intake towers for nighttime effect, and reworked the powerhouse in a modernist, stripped-classicism style. Further, an open competition to find a monument for the dam was arranged; the winner was Oskar Hansen, whose strange winged figures, seated but still thirty feet tall, now adorn the site. Wilson notes that “these surrealistic apparitions underscored the unreality of a dam and lake in the middle of a hostile desert”. Hansen also was responsible for a star map set in the floor of the monument; this map, indicating dates of historical importance, linked the moment the Hoover Dam was dedicated with such events as the building of the pyramids and the birth of Christ. Hansen believed that “in remote ages to come, intelligent people” would be able to discern “the astronomical time of the dam’s dedication”. The alliance between the modernism of the engineering and architecture of the Hoover Dam rendered a coherent and cohesive structure. Because of Kaufmann’s design, the engineering feat is appropriately reflected in the magnificence of the facade. Indeed, as an icon of modernism, the Hoover Dam helped to usher in a new era. From the engineering point of view, important chronological dates can be cited. In 1936, First generator, N-2, goes into full operation. On October 26th. Second generator, N-4, goes into operations. On November 14th. Third generator, N-1, starts production December 28th. All turbine generators were manufactured by Westinghouse Electric Company. In 1937, Generators N-3 and A-8 begin operation March 22 and August 16. In 1938, Lake Mead storage reaches 24 million acre-feet, and lake extends 110 miles upstream. Generators N-5 and N-6 begin operation June 26 and August 31. In 1939, storage in Lake Mead reaches 25 million acre-feet, more than 8 trillion gallons. Generators A-7 and A-6 begin operations June 19 and September 12th, respectively. With an installed capacity of 704,800 kilowatts, Hoover Powerplant is the largest hydroelectric facility in the world- a distinction held until surpassed by Grand Coulee Dam in 1949. In 1940, power generation for the year totals 3 billion kilowatt-hours. All-American Canal placed in operation. Metropolitan Water District of Southern California successfully tests its Colorado River Aqueduct. In 1941, Lake Mead elevation reaches 1220.45 feet above sea level July 30; lake is 580 feet deep, 120 miles long. Spillways are tested August 6th, the first time they have ever been used. Generator A-1 placed in service October 9th. Dam closes to Public at 5:30 p.m. December 7th, and traffic moves over the dam under convoy for duration of World War II. 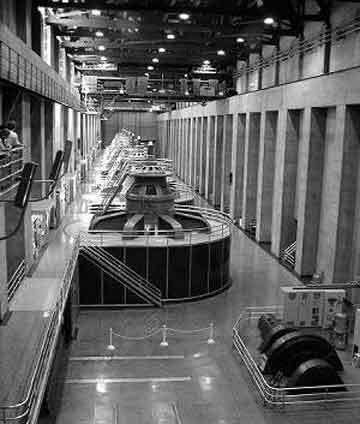 In 1961, the power installation at Hoover Dam is complete when the final generating unit, N-8, goes on line December 1st. The installed generating capacity of Hoover Powerplant, including station service units, reaches 1,334,800 kilowatts. The completion of the dam drew massive crowds for Dedication Day, September 30, 1935. Franklin D. Roosevelt delivered the address, calling the Hoover Dam “an engineering victory of the first order–another great achievement of American resourcefulness, skill, and determination. Oskar Hansen was born in 1892 to Oskar II and Josephine Maximiliana in what was then the dual Kingdom of Norway and Sweden. Before coming to America, he served as a merchant seaman, then joined the French Foreign Legion in North Africa where he attained the rank of General of Brigade. In the US he served in the US Army and rose from Private to Major. Upon leaving the Army, he built a home and sculpture studio near Charlottesville, Virginia. While Hansen wrote on theology, astronomy and the arts, he is best known for his work as a sculptor. His most famous works include the winged figures on Hoover Dam which were commissioned by the US Government Parks Department, and the Star Map, also at the Hoover Dam, which was created in collaboration with The Smithsonian Institution and the US Naval Observatory. Hansen’s designs for the Hoover Dam are a mix of Art Deco and Futurist styles. Atop the dam on the Nevada side is a large stone platform supporting two famous bronze figures of the Republic, wings lifted, that guard the American flag. In addition, there is the elegant and fascinating mosaic floor that surrounds the sculptures. The winged figures are 30 feet high. Their shells are 5/8-inch thick, and contain more than 4 tons of statuary bronze. The figures were formed from sand molds weighing 492 tons. The bronze that forms the shells was heated to 2,500 degrees Fahrenheit, and poured into the molds in one continuous, molten stream. The figures rest on a base of black diorite, an igneous rock. In order to place the blocks without marring their highly polished finish, they were centered on blocks of ice, and guided precisely into place as the ice melted. After the blocks were in place, the flagpole was dropped through a hole in the center block into a predrilled hole in the mountain. Near the figures and elevated above the floor is a compass, framed by the signs of the zodiac. There are four towers sticking up from the top of the dam. The middle two are elevators and they are decorated with bas-relief. The five bas-reliefs on the Nevada elevator tower, done in concrete, show the multipurpose benefits of Hoover Dam: flood control, navigation, irrigation, water storage, and power. Another designer that assisted architect Kaufmann was Denver artist Allen True. 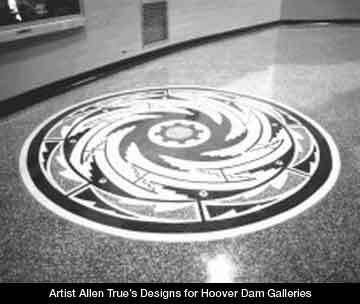 True was responsible for one of the dam’s most distinctive motifs–the Southwestern Indian designs in the terrazzo floors. Using such sources as an Acoma bowl and Pima basket, True linked Native American geometric concepts with Art Deco design. Many of the Indian designs were based on centrifugal themes, which related to the turbines in the power plant. True’s colors are truly striking. He used black, white, green and dull-red ochre chips in the terrazzo floors to contrast with the black-marble walls. True also specified the red color for the generator shells in the power plant, a sight that still commands visitors’ attention. You can see the power plant and terrazzo work during a tour of the dam. Following an elevator descent of 530 feet, you emerge into seemingly endless galleries. There you find gleaming terrazzo floors imbedded with the Southwestern Indian patterns adapted by True from baskets, pottery, and sand paintings. This entry was posted on Friday, June 25, 2010 at 3:35 am and is filed under 2012 Prophecy, New Mesoamerican Mythology with tags 2012, american, dam, design, hoover, mayan, native. You can follow any responses to this entry through the RSS 2.0 feed. You can skip to the end and leave a response. Pinging is currently not allowed. You’re welcome! If you have the chance to visit Hoover Dam in 2012 do it…someone very dear to us will be transforming himself into a protogod at that place full of memories and imprints. Empower your tuning. Thanks for visiting our blog.